Mobility at the heart of radio: how natural? In my previous article, I said that radio has all the characteristics of next-gen media – starting with it being the media of proximity by excellence. From BBC Home Service during WWII to Radio Caroline broadcasting rock music in the early 60s, or your morning show while you’re driving to the office, radio has always held a special place in our lives. Among the many reasons, radio connects with you in a way that no other media can. Facebook or Instagram are nice, but sometimes you want something more than a picture of the last dinner of your friends. 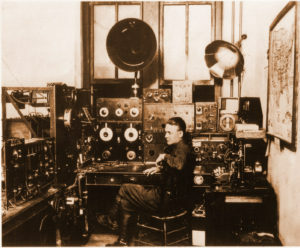 Unlike TV that is much more rigid and generalist, radio is fast and responsive. There is also something deeply human about radio that is missing in other media. At the end of the day, radio is made of people talking, listening, interacting and sharing content. It’s a true community in the best sense of the word. For the audience, this really leverages more engagement, more trust and more loyalty – and for radio broadcasters, these are unique attributes to cherish and to foster in order to sustain their business. 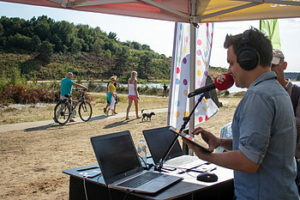 Offering mobility to radio presenters and teams is key in this strategy. How can radio be nimble and relevant if production teams are grounded by fixed facilities and challenging logistics? How to produce content that feels intimate to your audience if the content is just reported from the studio, rather than experienced by the host? Take music festivals for example. The ability to have your production team on site, among the crowd, interviewing bands and sharing the atmosphere completely transforms the experience. But radio has covered festivals for decades – so what’s new? Imagine, instead of moving trucks to the location, pulling cables in all directions, having to deal with all the logistics of working with a full crew, you can now do that with one or two people – straight from their laptop. Instead of bringing each group to the truck, you can now go directly back stage, right before they go on or right after they come off stage. Or you get fans’ impressions directly from the festival’s tent camp. Or you want to produce a show from a hot air balloon. Or on a mountain. Or at the local fair in your village. Or just from the comfort of your home – because there is no need to add one more car to the traffic jams this morning. This kind of mobility can easily be provided by today’s off-the-shelf laptops – and the studio is totally virtualised. Mobility and radio have been closely linked together for a long time; now, solutions exist to make it much easier and smoother. Why? Because content is king, and technology is there to serve the purpose.